View More In Decorating Tools - Page 3. At Last, BazzGoods Fullest Cake Decorating Supplies Have Just Been Released! ... baking delicious cupcakes for your kids? ... creating marvellous birthday cakes for your beloved ones? ... frosting and icing pretty much anything you can eat? If you are nodding, then you should keep on reading. We have the ultimate cake décor kit for you. Skyrocket your cooking techniques, facilitate your kitchen life and make pastry baking fun again! Nothing can stop you now. You have BazzGoods cake decorating box by your side. Make Cakes, Icing, Frosting & Edible Décor Like A Real Chef! Save your precious time and hard-earned money from expensive bakery cakes with this cake decorating supplies box. It has everything you need to get you started. Beautiful Russian piping tips, icing bags and cleaning brushes, cupcake cups, couplers, and shaping tools as well. With 109 items in total, this cake decorating box shouldn't be missing from your kitchen arsenal. Bake and decorate anything you want. From cute baby cupcakes, birthday and wedding cakes, buttercream frosting, ice cream, to biscuits, theme cakes, Halloween treats, mouth-watering desserts, and chocolate fudge cookies. Still Not Sure About This Kit? 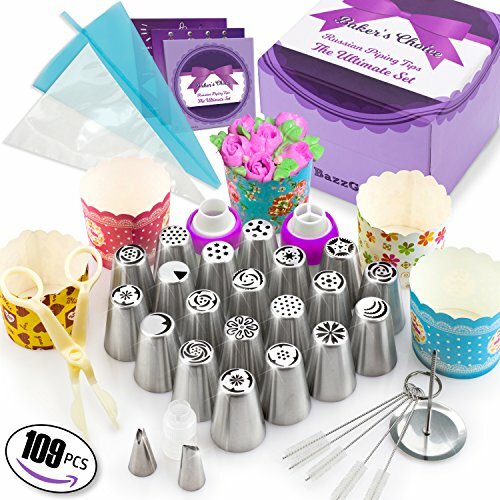 · Full pack cake decorating kit with 109 supplies. · Rust proof and dishwasher safe stainless steel piping tips. · Use for icing, frosting, glazing, shaping, and decorating. · For weddings, birthdays, baby showers, anniversaries, celebrations, and more. · Bonus 25 cupcake cups and booklet with flower chart and instructions. · 1-Year hassle free money back guarantee - NO QUESTIONS ASKED. ✅ 3 LEVELS ABOVE ALL ! - Not another dull, cheaply made set, ours was designed by a MASTER Baker. Whether it is a cake or cupcake With 109 baking supplies you`ll be able to create your own decorative masterpieces of all shapes and sizes, no matter what your skill level may be. ✅ A PERFECT 5 STAR RATING GIFT - Our cake decorating Kit comes in a decorative designed gift box, It is a truly unique present for any baking or cooking fan. Surprise your relatives, friends or even yourself with our premium kitchen baking set. ✅ SAFE AND EASY TO USE: This baking set is easy for both kids and adults to use. BazzGoods cake piping set is made from FDA APPROVED materials, top quality and durable stainless steel and Eco-friendly plastic. Use these cake tools for fun and easy cake decorating. 100% satisfaction guaranteed! ✅ A MONEY BACK GUARANTEE - Don`t risk buying a cheaper product, none of them match the quality and the diversity of ours. Still hesitate? With our 1-year hassle free money back guarantee, your risk level is 0. ✅ RICH & DIVERSIFIED PACK - You get ✔ 20 beautiful designs patterns Russian Piping Tips ✔ 50 disposable bags ✔ 1 reusable icing bag ✔ 25 free colorful cupcake cups ✔ 1 flower lifter ✔ 1 flower nail ✔ 1 petal piping tip 104 ✔ 1 leaf tip number 70 ✔ 1 single color coupler ✔ 1 Tri-color coupler ✔ 1 leaf coupler ✔ 5 cleaning brushes ✔ Storage Box ✔ BONUS user-friendly guide book with flower chart & instructions. If you have any questions about this product by Bazz Goods, contact us by completing and submitting the form below. If you are looking for a specif part number, please include it with your message. Disney Coco Movie Deluxe Cake Toppers Cupcake Decorations Set of 15 with 12 Figures, Charm, Tattoo and Sticker featuring Miguel, Mama Imelda, Spirit Guide and More!